Former president of Taiwan, Chen Shui Bian, has been sentenced to life imprisonment for corruption. Adversarial relationship between MSM and New Media will only increase the already high levels of apathy. In another pitiable attempt to rebuild the credibility of the mainstream media, Rear Admiral (NS) Lui Tuck Yew, Acting Minister at the Ministry of Information, Communications and the Arts (MICA) took yet another potshot at New Media. As senior political correspondent Clarissa Oon reports, Minister Lui not only accused New Media of being biased but also adversarial. Speaking at a dialogue session with the Singapore Press Club and Institute of Public Relations of Singapore (IPRS), he praised the Mainstream Media (MSM) for being competent, comprehensive, objective, professional and accurate. According to him, MSM reflects the reality on the ground more accurately than any other sources. 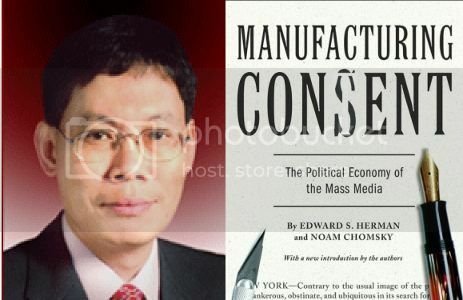 He also cited recent surveys by AC Nielsen and the Institute of Policy Studies, which found that a majority of Singaporeans used MSM as their primary news source and found it credible. Ironically, Oon’s account sounded more like a description of the contents in a handbook than the balanced news report that Minister Lui applauded in his speech. Reading her version of the event, he seemingly instructed MSM on the appropriate responses in ‘battling the influence of online media’. The headline also showed his seniority or consultancy position, with respect to the MSM: “Advice to MSM: stay balanced”. In addition, he revealed his strong dislike of some allegedly one-sided socio-political blogs, using these examples to dismiss the legitimacy of New Media at large. Depending on which version the reader sees, the story turns out remarkably different. The government-issued speech transcript reveals nothing of his reported contempt of New Media. Two examples displaying the biasness of New Media were cited by Minister Lui – a video that showed an elderly woman collecting cardboard without revealing that she had a 3-room flat that was fully paid for (as if a fully-paid flat represents a recurring income stream), and web sites that accuse the Singapore government of being corrupt. These were not mentioned in the transcript at all. Neither was his reported comparison of the media in Singapore and Malaysia. Despite the loss of detail, the watered-down, tidied-up version of the actual event still reveals much about how this former military man reacts or would react to changing media landscapes in Singapore. As the former Chief of the Republic of Singapore Navy (RSN), Minister Lui displays the temperament of one who only knows of control and battle, not cooperation. Reacting defensively to what he perceives as an onslaught, he asks, “How do we hold the ground that we [MSM and the Government] have so painfully gained over the many years of credible and trusted journalism?” He also differentiates his perceived enemies from his apparent allies. “Some of their [New Media] practices, some of their approaches, actually detracts and subtracts from what you have painfully gained and built up over many, many years,” he said. Fortunately, MSM is not a quasi-military channel. Even as Minister Lui bravely tries to adapt his military style to his civilian outpost MICA, he reveals his desire to control information. Either from continued surveillance of online debate or to repackage the same state-issued information in forms more palatable to younger consumers. This by no means contributes to the credibility of MSM, especially when mainstream journalists have no recourse to make their grievances public. In an apparent war cry, Minister Lui hailed, “These [credibility and broad readership] are strengths that we [MSM and Government] must hold on to, and these are strengths that we must guard jealously, preserve and strengthen.” Can MSM and New Media co-exist credibly and peacefully? Is there even anything to jealously protect, or to guard with respect to media credibility? The continued cannibalising of relationship between MSM and New Media will only serve to alienate the already disillusioned Singaporeans. With both forms mutually demolishing the credibility of the local media at large, there seems to be few channels of information that local audiences can receive without sacks of salt. Indeed, if the MSM and its patrons do dismiss New Media as illegitimate, inaccurate and without a large readership, is there is need react antagonistically? Quite the opposite, the solution to a declining MSM news readership, and the increasingly popular use of online news is to cooperate, filling up the gaps where the other has left off. Both sides should work towards expanding news readership by providing a multiplicity of perspectives, and not drive the readership pool into a small puddle. Despite its (probably) good intentions to regulate media, the Government is mistaken if it thinks it can or should regulate the media through MICA. Minister Lui maintains that there has been credibility ‘ground’ gained over the years, though insiders say that the current mainstream media is only a shadow of what it once was – in the 1980s. Journalists have stopped being critical and are instead focused on being politically correct. A well-known media observer had remarked that media senior executives have become too ‘well fed’ and thus, have become risk averse. What has resulted, as a consequence of government policy, is something the government clearly does not want – loss of its main communication channel, less touch with sentiments on the ground and an apathetic nation. Unlike scientific or mathematical truths when 1 +1 always equals 2, the truth in politics or society at large is always a multiplicity of perspectives. It is an amalgamation of witness reports or observers who analyse the issues at stake with care. By denying this core fact about what ‘truth’ is, foolishly thinking that the news behaved as it would in military organisations, Minister Lui becomes an obstacle to finding Truth, which lies in between a plurality of sources. By retaining local readership with local news provided – albeit by amateur local reporters – online, New Media is in fact doing MICA a favour by keeping Singaporeans un-disillusioned and interested. Need there be such a sharp distinction drawn between MSM and New Media? After all, if every party works towards the betterment of Singapore society, is the end goal not the same? Perhaps the only barrier to official recognition of New Media as a ‘real’ media due is the Newspaper and Presses Act. So here’s a challenge: If New Media is indeed, pale in comparison to MSM, lift the Act and let it grow. New Media is not an enemy of the State. New Media is as much as a stakeholder as MSM in the Singapore Society. Read also: Lui Tuck Yew should take his head out of the sand by Ng E Jay. And: “Adversaries” are patriots as well by Ravi Philemon.